Nicely sharp and lit - but I don't get it as a portrait, or anything else, I'm afraid. Definately interesting though! Someone put a leaf in front of your model. 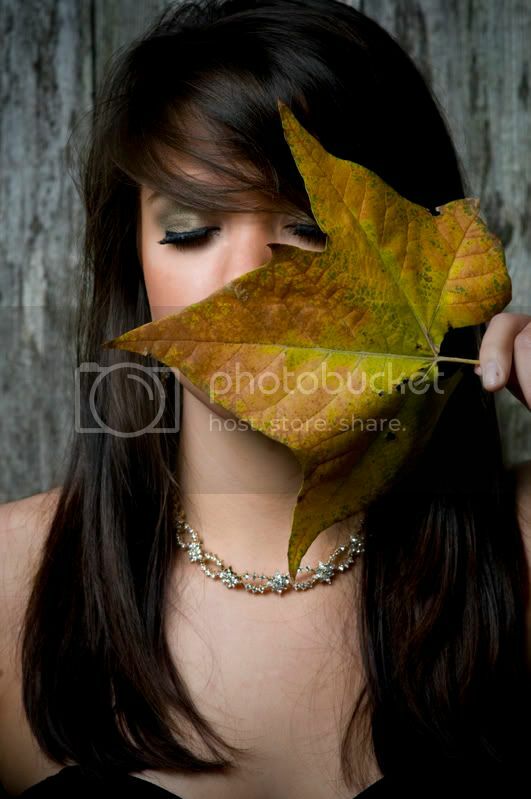 As others have said this is a nice portrait of a leaf with from what I can see a beautiful model in the background. I would have had the leaf fully covering her left eye and had her right eye open and then crop the whole thing more closely. Nicely lit, beautiful lady, I am not sure what exactly you were going for here, but it is interesting concept. I like the concept but the placement or size of the leaf does not look right IMHO. Nice to see something unconventional. I love it! I agree that it doesn't work as a conventional portrait, but it's creative and alluring. I especially like how her eyes are looking down as they are - very creative. The only thing I would do is crop out everything below her necklace (and bottom of leaf) as it doesn't add much; plus, it gets darker there and reveals the light dropoff from the outer edges of the snoot.